Harper's Magazine Forum: "What Went Wrong in Ohio?" What Went Wrong in Ohio? Posted on Monday, July 25, 2005. A forum on voting rights in the 2004 federal elections. On July 21, 2005 Harper's Magazine hosted a forum on voter rights as they related to the 2004 federal election. The forum was held at the U.S. Capitol, and was moderated by Harper's Publisher Rick MacArthur. The panelists were John Conyers, Jr., Stephanie Tubbs Jones, Sherrod Brown, Eleanor Clift, and Mark Crispin Miller. Miller's piece “None Dare Call it Stolen” appears in the August 2005 issue of Harper's Magazine. The forum was held to discuss a fundamental aspect of the people's business—that of voting rights in the 2004 federal elections and the rather substantial evidence that these Constitutionally guaranteed rights were extensively violated in the state of Ohio—indeed, systematically violated and on a grand enough scale that the election may have been corruptly swung in favor of President Bush and against Senator John Kerry. Ohio, as things turned out, was the key battleground state. Had Senator Kerry won Ohio he would have won the electoral college and would now be president of the United States. The Secretary of State's office in Ohio initially declared a 118,601 margin of victory for Bush over Kerry; after a county-by-county recount marred by highly inconsistent and evidently illegal procedures, the official victory margin for Bush was reduced by 144 votes. For the record, the Green Party lawsuit challenging the integrity of the recount in federal court has still not been heard—the Greens claim that state's recount was not conducted using random selection of precincts in 86 of the 88 counties, as required by state law. The principal evidence for voting irregularities in Ohio is contained in the Conyers Report on the 2004 Presidential Election, prepared by the Democratic staff of the House Judiciary Committee, and now published as this book, also entitled What Went Wrong in Ohio. This investigation was initiated and supervised by Representative John Conyers Jr. of Michigan, the ranking Democrat on the Judiciary committee. The Republican majority on the Judiciary Committee declined to participate in the Conyers inquiry, so we do not have the benefit of their insights. This is unfortunate, given that one of the principal subjects of the Conyers investigation is an Ohio Republican, Secretary of State Kenneth Blackwell, who was also co-chairman of the Ohio Bush re-election campaign. Nevertheless, even lacking Republican input, the Conyers report is an altogether remarkable document. It is by far the best and most complete dossier on voter disenfranchisement and possible vote fraud in Ohio, and it has more than enough hard information to justify a public conversation. There's a second question raised by the Conyers Report, albeit implicitly, which I hope we will have time to explore today. For as remarkable as the information in the Conyers report may be, the near total media silence that greeted it when it first appeared—as well as the scant coverage of the formal objection to the Ohio electoral vote count filed by Representative Stephanie Tubb Jones—is, to my mind, just as remarkable. So remarkable, in fact, that Harper's Magazine has devoted its August cover story to summarizing and explicating the Conyers report and to asking why it wasn't considered more newsworthy by the national media. Even though eight months have passed since the election, the material compiled here seems to us fresh and scandalous in large part because it has gone almost entirely unreported in the press. As William Raspberry wrote in the Washington Post, "political reporters, mainstream editors and most of Congress seemed utterly unalarmed" by the reports of election chicanery in Ohio. The Conyers report, orginally titled, "Preserving Democracy: What Went Wrong in Ohio," was released on January 5 of this year—and our search on Google and Lexis Nexis turned up very little in the way of coverage. Given the stakes and given the well-reported disenfranchisement of African-American voters in Florida in the 2000 election, this seems to be a scandal every bit as important as the election irregularities in Ohio. Rick MacArthur, publisher of Harper's Magazine. John Conyers, Jr., Democrat of Michigan, is the ranking Democratic member of the House Judiciary Committee. Elected to the House in 1964, Representative Conyers is the second most senior member of this body and his personal political parallels the history of the civil rights and voting rights, movements in this country. He was, notably, the driving force behind the Help America Vote Act of 2002. Stephanie Tubbs Jones is a four-term Democratic congresswoman representing the 11th District of Ohio. A lifelong resident of Cleveland, Representative Tubbs Jones was a prosecutor and a judge in Ohio before she came to Washington. She currently sits on the House Ways and Means Committee, the first African American woman to do so. It was Congresswoman Tubbs Jones who, partly on the strength of the Conyers investigation, formally objected to the certification of the Ohio electoral count last January. Sherrod Brown has represented Ohio's 13th District as a Democrat since 1993 and served as Ohio's Secretary of State for two terms, from 1982 to 1990. He is the author of Myths of Free Trade, Why American Trade Policy has Failed. Eleanor Clift is a contributing editor for Newsweek Magazine and a familiar face on television public affairs programs. She has covered the White House, presidential campaigns and Congress and is the author, with her late husband Tom Brazaitis, of two books, most recently Madam President: Shattering the Last Glass Ceiling. She contributed to Newsweek's instant book on the 2004 election, and she has contributed to Harper's Magazine. Mark Crispin Miller is a professor of media studies at New York University and the author of several books, most recently Cruel and Unusual, Bush/Cheney's New World Order. Professor Miller wrote the cover story for the August issue of Harper's Magazine. This is What Went Wrong in Ohio?, published Monday, July 25, 2005. It is part of Features, which is part of Harpers.org. This post was prepared for the Electronic Frontier Foundation's "Blog-A-Thon", celebrating the contribution bloggers have made to the fight for truth. As of September, 2004, I didn't really understand what a blog was. I thought it was just for people who had their own web sites, and I thought it was just being used by teenagers and people in their early twenties as a way of keeping in touch with their friends. In late September, 2004, I attended a panel discussion at which I learned more about the whole spectrum of blogging, that there were web sites where one could set up a blog for free, that blogs were as much for adults as kids, that there was a great diversity of content among blogs, and that much important writing was going on in the blogosphere. So I went back to my office, and in about 5 minutes had started a blog on blogger.com which I'd entitled "Fairness". During late September and the month of October I posted 7 or 8 general items there, about my political views. From October 30, 2004, through Election Day, November 2, 2004, I served as a telephone 'election protection' hotline volunteer in Columbus, Ohio. In that capacity I learned of massive fraud, suppression, and disenfranchisement of Democratic voters throughout Ohio, and of very valiant voters waiting on line for as long as 11 hours, so as not to permit their precious right to vote to be taken away from them. The next day, November 3rd, while driving home to New York City, I learned that (a) John Kerry, had, incredibly, conceded the election, and (b) the major media were actually MISREPRESENTING what had happened in Ohio. The next morning, I knew that 15 or 20 friends would be asking me "So what happened in Ohio?" I decided that, instead of repeating the same thing 15 or 20 times, I would send those 15 or 20 people an email giving them my "Basic Report from Columbus". Then, if they had questions, I would answer them. A few coworkers did stop by my office before I'd had a chance to finish the email, and I told them "I"m sending you an email. Read that first, then I'll answer any further questions you might have". As I was about to send the email to those 15 or 20 people, I figured that -- since the media wasn't reporting it -- I might as well add another 30 or so friends to the recipient list, who might be interested in what had happened in Ohio. At that point I figured my involvement with the state of Ohio and the 2004 election was about over. Little did I know what lay in store. An hour or two later I discovered that my email had been broadcasted and rebroadcasted, and rebroadcasted again, and was all over the internet. I was receiving inquiries from people I'd never heard of, who'd received the email from people I'd never heard of. And I saw that various websites were quoting it. So I figured I might as well put my "report" up on my own little blog. The next thing I knew people were sending me information about the movement to set aside the fraudulent Ohio election results, and I decided to lend my blog to supporting the grassroots movement taking place all across the country to apply the rule of law to the Ohio election. I renamed my blog "Ohio Election Fraud (Formerly "Fairness")". 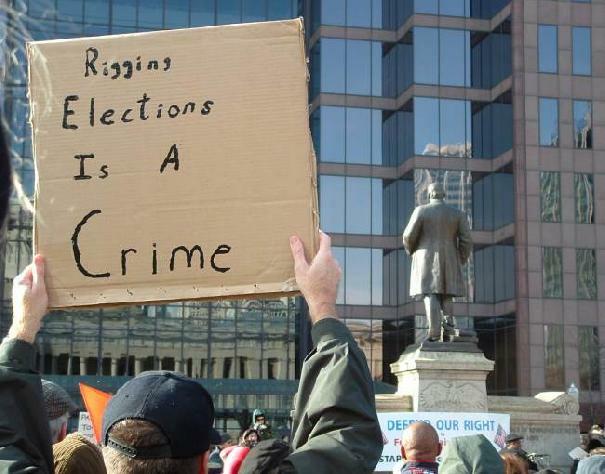 And it became a central repository for information about protests, teach-ins, legal challenges, and the growing mountain of evidence of chicanery in the 2004 Ohio election. One highlight of my experience was visiting Washington DC on January 6, 2005, the date the Senate was meeting to accept -- or not accept -- the illegally appointed Ohio electors. I attended some of the protests taking place, marched in the streets, and got to actually meet, in person, some of the beautiful activists and patriots whose work I had been supporting on my blog. Federal Law Suit to Reform Ohio Elections Commenced Today!!! (Toledo, OH) – Seeking to redress decades-old Constitutional defects in the way Ohio conducts federal elections, the League of Women Voters of Ohio, the League of Women Voters of Toledo-Lucas County, and more than a dozen Ohio citizens today filed a historic, non-partisan lawsuit against the State of Ohio. The lawsuit alleges that Ohio Secretary of State J. Kenneth Blackwell, Governor Bob Taft, and their predecessors have failed to protect the fundamental rights of eligible Ohio voters to cast a meaningful ballot, as required by the Equal Protection and Due Process Clauses of the Fourteenth Amendment to the United States Constitution. In addition, the complaint contends that Ohio has not met its obligations under the Help America Vote Act. The lawsuit does not challenge the results of any past elections, but instead seeks to bring about changes necessary to protect the rights of Ohio voters in future elections. Filed in federal court in Toledo, the complaint chronicles deficiencies over more than three decades, including widespread problems with the voter registration system, the absentee and provisional ballot processes, the training of poll workers, the organization of polling places and precincts, and the allocation of voting machines. The lawsuit seeks to compel the state to uphold its constitutional obligation to provide for the voting-related needs of its citizens in time for the November 2006 general election. The relief sought would require the state to repair the problems at all stages of the electoral process that have disenfranchised and overly burdened Ohio voters and made the ability to vote and be counted vary widely from county to county. “This lawsuit is not about overturning election results, it’s about fixing a broken election system that is preventing people from having their vote counted,” said Peg Hull Smith, spokesperson for the League of Women Voters of Toledo-Lucas County. and failure to train poll workers. The plaintiffs are represented by the Lawyers' Committee for Civil Rights Under Law, the law firms of Proskauer Rose LLP, Arnold & Porter LLP, and Connelly, Jackson & Collier LLP, along with the People for the American Way Foundation, the National Voting Rights Institute, and the Lawyers’ Committee for Civil Rights of the San Francisco Bay Area. Columbus - A member of the Franklin County election board said Friday [July 15th] that prosecutors are investigating whether a GOP political consultant tried to bribe the board's director to buy voting equipment made by his client, Diebold Inc. The director, Matthew Damschroder, has told prosecutors that the consultant, Pat Gallina, came to his office in early 2004, offering him $10,000. "Pat Gallina came into my office at the Board of Elections and said, 'I'm here to give you $10,000. Who should I direct it to?' " Damschroder recalled. "I said, 'Certainly not to me. But I'm sure the Franklin County Republican Party would appreciate a voluntary donation. That was my first mistake." This weekend the Democratic Leadership Council meets in Columbus, Ohio at the Renaissance Hotel for a three-day National Conversation. Join GrassRoots Advocates for Democracy (GRADs), the Ohio Backbone Campaign, progressive people of faith, and local peace activists as they engage in a Community Conversation at Ohio Honest Elections 341 S Third Street, Columbus Ohio, 614/224-6954. Meet with Sherole Eaton, Hocking County Board of Elections whistle blower from 1 PM- 3 PM. Sign in for demonstrations on Saturday and Sunday, July 23 and 24, 2005 from 11 am till 3 pm. Demonstration at the Renaissance Hotel, 50 N. 3rd Street, daily 4-8 pm. Agreement has been reached in the Hocking County Litigation, brought by The Alliamce for Democracy to bar Hocking County's board of elections from taking further proceedings to remove Sherole Eaton in violation of the Public Meetings Law, to extend the temporary restraining order to August 15th, while the parties proceed to seek mediation of the dispute. "Members of the Progressive Ohio Backbone Campaign ... on Monday morning, July 11, ... filed criminal charges with the Hocking County Sheriff’s Department against the county’s Board of Elections (BOE) Director Lisa Schwartze. ".... The charges filed against Schwartze.... pertain to her alleged illegal shredding of election documents, the Free Press has learned. "Eaton says that all investigators would have to do is ask Schwartze for hard copies of the change of address forms to verify her allegations. --To bring together grassroots election reform organizations, legislators, election officials, news media, and the general public to share best practices and innovative solutions for election reform. --To focus on solutions and empower participants with knowledge and tools to effect real election reform. --To provide a non-partisan and safe venue for discussing diverse opinions and alternatives for achieving clean elections. Progressive Ohio Backbone Campaign members will travel to Hocking County this morning to be part of complaints being filed by Hocking County Democrats against the Hocking County Board of Elections (BOE) and it's director Lisa Schwartze. A complaint against the entire board relates to the board calling today's meeting without adequate public notification. Legal matters are the topic of today's hastily called meeting. Last Tuesday, at a public BOE meeting, Progressive Ohio Backbone Campaign members and others from the Columbus area, witnessed the director of the BOE admit she used the BOE office for Republican Party fund-raising. Three of these witnesses intend to join Hocking Democrats today to file affidavits with county prosecutor Larry Beal regarding complaints against BOE Director Lisa Schwartze. In addition, the witnesses intend to take part in complaints being filed against Schwartze with the Ohio Secretary of State and federal officials. Progressive Ohio Backbone Campaign member Ed Sisson will accompany the witnesses to document proceedings. However, all are encouraged to bring recorders and cameras, etc. Portland, Oregon, Saturday, July 16th, 2 PM - 5 PM. "Corporate Takeover of America's Elections -- Does Your Vote Count?" Time: Presentation: 2:00-4:00 p.m. / Questions: 4:00-5:00 p.m.
conflicts of interest, yet we are expected to trust them to count our votes. secret. Public monitoring of vote counting, our right by law, is eliminated. election outcomes and our democracy are left in doubt. threat posed to democracy by corporate controlled electronic elections. provides the public the right to observe and monitor vote counting. From Friday, July 8th, to July 11th, the Brad Blog will host an online Brad Blog-A-Thon. Kat L'Estrange, outstanding election rights activist, is working with the show, and guests will include David Cobb, Bob Fitrakis, Bernie Ellis, Clint Curtis, Robert Koehler, and others with lots of insight to share on the stolen 2004 election. Bernie Ellis date & time TBD. Los Angeles, CA -- July 7, 2005 – A unique effort to combine fundraising with special guest blogging by some of the bright lights in the progressive movement will take place on the popular Brad Blog, website of investigative blogger Brad Friedman. The event will begin this Friday at 3:00 PM PDT and is scheduled to continue until the following Monday at 6:00 PM PDT. Guest bloggers will include recent Green Party Presidential candidate David Cobb; national award-winning journalist and Tribune Media Services editor Robert Koehler; whistleblower for the alleged Tom Feeney/Yang Enterprises, Inc. Vote-Rigging Scandal, Clint Curtis; and attorney, author and voting rights activist Bob Fitrakis, to name just a few of the notables who have agreed to volunteer their time and efforts to promote this novel idea. At designated times, most of these guest bloggers will be available “live” on-line at the site to respond directly to reader questions and comments. The event was conceived and planned and will be produced on BradBlog.com by a number of fans of the the blogsite. While many blogs allow readers and guests to post their pieces and commentaries on the site, it is rather unprecedented for a blogger to turn over his entire blogsite to a group of his readers, at their request, to run an event of this fashion. The event will also attempt to provide a forum to advance issues and concerns of the progressive community that, they feel, are not being covered by the corporate owned, mainstream media, even when these issues would seem to be of critical importance in promoting an informed democracy. While most blogsites solicit donations and advertising, very few, if any, have major corporate sponsorship, and many reject the potential compromises that might accompany such sponsorships. This can make it an ongoing struggle for bloggers to make ends meet, while trying to do the job that they feel the well-financed mainstream media is failing to do. Mr. Friedman also hosts the Brad Show on Raw Radio and is a co-founder of VelvetRevolution.us, an umbrella group designed to coordinate the actions of progressive organizations. These projects are also currently primarily reader and listener supported. It is the hope of the planners of this event that reader organized efforts of this nature will serve as a model for other progressive blogsites to raise funds and thereby help maintain the kind of independent and alternative voices that blog readers perceive as a counter to the Corporate Media. Thursday, July 14, 2005, 7:00 - 9:00 P.M.
Gail Jonas - Citizen activist and California attorney who led a delegation of observes to Ohio in November 2004 to investigate the National Election, and was involved with Election Protection Coalition. The Alliance for Democracy has brought a lawsuit to prohibit the Hocking County Board of Elections from Attempting to Terminate Deputy Director Sherole Eaton without compliance with Ohio's Public Meetings Law. LOGAN — On Tuesday, a crowd of about two dozen spectators applauded when Columbus attorney Clifford Arnebeck handed Hocking County Board of Elections chairman Gerald Robinette a court order, signed by Hocking County Court of Common Pleas Judge Thomas Gerken, not to take any action to replace fired deputy director Sherole Eaton. And Robinette's conflicting stances on whether director Lisa Schwartze used Board of Elections business hours to conduct the 2004 general election campaign for the Republican Party first drew gasps of outrage, and then derisive laughter, from members of the audience. The storm didn't end there. Book Signing, with Music, Art, Poetry, Wine & Cheese. The book signing is for the new book "Did George W. Bush Steal America's 2004 Election - Essential Documents" by Bob Fitrakis and Harvey Wasserman. The authors will be autographing books that evening. The event is this coming Saturday, July 9th from 4:00 p.m. until midnight. Please click on the below link for all the details. RSVP if possible so we have an idea of how many people will be attending. If you are unable to RSVP, but end up able to attend, just show up. RSVP on the web site below. Citizens must once again "BE THE MEDIA" to spread the truth! Once again, the Fourth Estate has failed the American public: the press, as well as mainstream media in general, failed to show up to cover an historic hearing on the REAL, DOCUMENTED facts about election fraud in November 2004 which were presented at a citizens' organized hearing in Houston last Wednesday, June 29th. The hearing was held one day before the James Baker/Jimmy Carter Federal Election Reform Commission hearing, which election reform groups agree has successfully avoided confronting the truth about election fraud in this country to this date. The exceptions were two local KPFT radio journalists, Pokey Anderson and Lisa Cohen, and one Houston IndyMedia representative Lorie Kramer. Otherwise, no media deemed it important enough to cover the amazing evidence put forward by technical experts, journalists, attorneys, and citizens from across the country that could leave no doubt that the Presidential election of 2004 was stolen. The event was organized by Houstonian Kip Humphrey and his wife Carol who have refused to "just get over " the results of last year's election. Kip has been active in election reform since studying the Hart InterCivic machines used in Harris County (Houston) and watching as his son cast his first vote on what Humphrey believes to be a compromised voting system. Kip researched the many cases in Harris and Travis counties (Texas) that document voters attempting to cast a straight Democratic ticket finding that their vote for President was magically switched, apparently by the machine, from Kerry to Bush. Humphrey refuses to stand by, do nothing, and let his children inherit a corrupt voting system. This is the third major election reform event he and Carol have organized. The first was the "51 Capital March" of December 12th last year, which resulted in 39 states holding protest rallies at their capitals, denouncing the results of November's election. Kip opened the meeting. The Election Assessment Hearing had the format of a Congressional hearing. Expert presenters gave testimony from a table facing the stage, where panelists sat to receive the information. The panel consisted of: Larry English, Hearing Chairperson and president of INFORMATION IMPACT. English is a renowned authority on information quality processes; Marybeth Kuznik, a 15 year poll worker from Pennsylvania; Eve Roberson, a retired elections supervisor from Santa Rosa, California; Seth Johnson, information quality improvement specialist from New York (and Hearing Vice-Chairperson); and Tom Oswald, a civil and commercial mediator from Ohio. The venue was the Garden Center at Hermann Park. As Hearing Chair Larry English noted in his opening remarks, this was the first time our election process has been reviewed by true information quality management principles. The hearing was multi-purpose: to illuminate critical information about November's election which had not yet been addressed by the Baker/Carter Commission; to assimilate a written record of testimony given by experts that day to present to the Baker/Carter Commission at their meeting the following day; and to compile a CD of this data along with other relevant election data submitted by experts who were not able to attend the day's event. The CD will be sent to Secretaries of State nationwide, to aid them in their critical decisions regarding the purchase of election systems. The states have been put under pressure by a January 1st, 2006 deadline set forth by the so-called "Help America Vote Act", which promises significant federal funds to the states in exchange for their upgrading voting equipment. Many believe that HAVA, in its demand for voting systems that will allow the disabled a private vote, has provided a careless rush on the part of the states to purchase paperless electronic voting systems. Such systems received a severe critique at the Hearing by researcher and journalist Bev Harris of Black Box Voting, who has successfully executed numerous hacks on such systems which all resulted in the "flipping" of elections from one candidate to another in a matter of 60 seconds or less and completely without detection. More on that to follow. Bob Fitrakis began his testimony citing case after case of voter disenfranchisement and illegal behavior by election workers in Ohio. Fitrakis holds a Ph.D in Political Science and a J.D. from Ohio State University; is a political science professor at Columbus State Community College, and the editor of the Free Press and freepress.org. He was one of the four attorneys in the Moss v. Bush case that challenged the Ohio election results. He served as an Election Protection Legal Advisor for two wards in the city of Columbus on November 2, 2004, and has recently edited a book entitled, "Did George W. Bush Steal America's 2004 Election? Essential Documents". Among some of the startling data he presented: an estimated 34,000 former felons in Ohio were given incorrect information by public officials regarding voting; (Ohio re-enfranchises felons once they have served their time.) Secretary of State Kenneth Blackwell issued a ruling that any voter registration on anything but 80 bond cardboard stock would be invalid (ruling later reversed due to public outcry); absurd design of absentee and provisional ballots, leading to many accidental votes for Bush; private parties processing voter registration; 3 ½ hour waits to vote, frequently in the wrong line, which led to many voters leaving due to time constraints; arbitrary and last-minute switching of polling places; threats of arrest to international voting observers; pre-punched ballots (votes pre-cast for Bush); double counting of absentee ballots. This is just a partial sampling of the documented data presented by Fitrakis to this Hearing panel. Reverend Bill Moss of Ohio, the lead litigant in the now famous "Moss vs. Bush" lawsuit which attempted to overturn the results of the Ohio presidential election, testified to the panel about voter discrimination experienced by his family, as well as many others, in Ohio in November. "A great crime has been committed against the American people," Moss stated in his testimony, "and it's not enough to say that we will prevent this from re-occurring. We must address the cause of the crime". Moss decried the lack of sufficient voting machines in minority districts, rampant "dirty tricks" committed by election officials in Franklin County, Ohio, and described his surprise upon seeing the five squad cars parked conspicuously at his polling place. He wondered: "Why are the police here? Who are they here to protect?" The only logical answer was that police were there to intimidate voters in his primarily minority district. Moss added that democracy is more at risk today because of election fraud than at any other point in his lifetime. Dr. Richard Hayes Phillips, retired college professor from New York, and twice a recognized expert in federal proceedings, had analyzed 2004 election results at the precinct level in fifteen Ohio counties. He was a leading statistician in the Moss v. Bush lawsuit. In his Hearing testimony, Dr. Phillips identified three major problems with the Ohio election: voter suppression; votes cast but not counted; and alteration of the vote count. He gave excellent examples from each category. Echoing some of Fitrakis's examples of voter suppression, he also added: long-time residents removed from the voting polls; broken voting machines ("they've been like this all day! "...poll workers said;) polling stations running out of ballots and turning people away; voters sent back and forth between polling places; long lines not designated by precinct causing people to wait for hours in the wrong line. Statewide, there were 35,000 provisional ballots and over 92,000 regular ballots that were not counted as votes for president. Most of these are punch card ballots, and are highly concentrated in precincts that voted overwhelmingly for Kerry by margins of: 12 to 1 in Cleveland, 7 to 1 in Dayton, 5 to 1 in Cincinnati,, 4.5 to 1 in Akron, etc. Phillips says, "This cries out for an examination of the uncounted ballots and the machines that failed to count them." Quoting Dr. Phillips: "In Miami County, after 100% of the precincts had reported, more than 18,000 votes were added to the totals." "In Mahoning County, the Board of Elections reported that 20 to 30 touch screen machines had to be recalibrated because votes were being counted for the wrong candidates. Voters had to scroll through as many as FIVE TIMES before their choice for president was registered. In some precincts, machines failed to record votes for Kerry and defaulted to no choice at all. In other precincts, touch screens were programmed to default to Bush unless the voter successfully overrode the default choice." All of this led to his pushing for a criminal investigation into the Ohio election, something that is yet to occur. Dr. Phillips' closing remark was notable: "It is my professional opinion, having exhaustively examined the available evidence, that the 2004 presidential election was stolen." Bev Harris of Black Box Voting gave detailed and expert testimony, some of the most shocking of the day related to electronic voting. She first gave a brief history of her accidental discovery in 2003 of the Diebold company's election software on the internet (the second largest voting machine vendor in the country) while researching for her book, "Black Box Voting: Ballot Tampering in the 21st Century". After downloading and studying the software along with computer programming experts, "stunning security flaws" were discovered which she called "a virtual handbook on how to tamper with an election using this software". Since that time Harris has pushed forward an aggressive agenda of vote fraud research, unveiling that a felon with a four year prison record named Geoffrey Dean was the senior programmer for Global Election System which was later purchased by Diebold, and was kept on there as a consultant; demonstrated along with several world class computer programmers and security engineers at two Washington D.C. press conferences last fall six different hacks possible to "flip" election results on both Diebold and Sequoia machines; sent out over 3000 "Freedom of Information Act" (FOIA) requests to every county in American requesting election records for November's elections; was handed fake precinct totals by election officials in Volusia County, Florida and then discovered the real totals in a garbage bag outside the building; and also sued Theresa LePore, then-election supervisor of Palm Beach County, for failure to provide the requested "FOIA" requested election documents. More recently, Harris was invited by Ion Sancho, Election Supervisor from Leon County, Florida, to attempt hacks on real election equipment using Diebold systems. Sancho wanted to see if his Diebold system was as secure as the state officials and Diebold company claimed. Harris invited two world-class computer programmers and security engineers, Dr. Herbert Thompson, of Florida, and Dr. Harri Hursti of Finland to execute the attempts. Within 90 seconds they had broken into the system and changed the vote totals any way they wanted. Harris claims, "The architecture of the Diebold Optical Scan voting system inherently supports the alteration of results," and added Hursti's remark: "If you liken the security of this system to a house with a door, this is like a house with an unlockable revolving door", and called it a voting system designed for "flexibility, not security". The programmers executed three separate "rigs" in less than five minutes; wrote their own program and fed it into the machine. The number of exploits possible with this design is "staggering", said Harris. Harris called into question U.S. computer programmers who have been studying this software for the past few years, asking, "Who knew about this, and when did they know it?" ...and, "What did election systems certifiers know, and when did they know it?" Paul Craft, a Florida state election systems certifier, has already admitted when asked that he knew of the above stated flaws in Diebold software, and told no one. Harris concluded her shocking testimony with the statement that, "Without 100% hand-counted paper ballots, you'll never find the hack". Elections held with paper ballots, hand-counted would have approximately four to five "attack vectors", according to Harris, while any election held with electronic voting equipment has as many as 50 to 60. When asked by a panelist, "Is there any way you believe this software could be repaired, or printers added, that would give it security and integrity?" her answer was a definitive "NO!". Lynn Landes is one of the nations leading journalists on the subject of voting security. She is and has been for years an ardent supporter of PAPER ONLY/NO MACHINES/NO ABSENTEE ELECTIONS. She has filed two federal lawsuits challenging the use of voting machines and absentee voting in elections for public office. Lynn's articles and research can be seen at her website www.EcoTalk.org. In her testimony, Landes stated that transparency is the most critical feature that should be demanded in the election process. In her research, she has found problem incidents with electronic voting that go back as far as the '80's. She stated that voting should be a public process, and that instead our own country has made voting a "privatized, mechanized system, a clandestine back-room process." Once considered a radical even among voting activists for her stand on "paper ballots ONLY", Landes noted that this position is now gaining popular support. "PAPER BALLOTS, HAND-COUNTED ON ELECTION NIGHT-it'll take about 12 hours. It is not rocket science, and it's not expensive!" she declared. "This is the only option we have left that is transparent", citing the total lack of integrity in our current voting systems. Hearing participants and audience noted with interest that three newcomers appeared around 2pm who were later introduced as Robert Pastor, the Executive Director of the Carter/Baker Commission, and two other Commission senior staff members, Kay Stimpson and John Williams. Pastor requested a summary of events up to that point in the Hearing, which was almost laughable to several of us, as it would be akin to trying to summarize "War and Peace" in 60 seconds or less. Nonetheless, Co-Chair Seth Johnson did a commendable job of doing just that. Pastor requested and was granted a few minutes to make some remarks. He made an attempt to create common ground by giving his own background in voting rights and election reform work, crediting himself as being one of the creators of the Help America Vote Act, (Thank you?!) and stated that "the most important element is that we are trying to improve our voting systems". Upon the conclusion of Pastor's somewhat predictable, though amiable remarks, Chairperson Larry English asked the audience if there were any questions. When Lynn Landes, Bev Harris, Robert Hayes Phillips, and others lined up at the side of the room, the rest of us had an idea about what was about to ensue. As for Pastor, he appeared clueless. But he soon took on a "deer in the headlights" look as the questions began: He could not aptly answer Landes' question about why major voting machine vendors' ties to the Republican party had not been addressed by his commission; when asked by Harris why she and her team who had executed hacks on the voting systems had not been invited to testify, his response was "We don't need to know what's wrong with the machines in order to fix them! "; when Phillips stated his qualifications and his analytical conclusion that the election was stolen, and asked if he was going to be invited to testify before the Baker Carter Commission, and if not, why not, Pastor's response was "We don't need such detailed information. We are trying to keep our focus on more generic issues." Such was our comic relief for the day. But don't expect to see any of this on mainstream media. It's just not important enough! Many thanks to all the organizers, our many wonderful presenters, and panelists. JOB WELL DONE! least one of the testing crews. discussion about the need to establish new polling places. discussion of the cost of relocating the Swerage and Water Dept. currently under investigation by the Secretary of State's legal counsel. "because there is a challenge", he said. agenda at the next regular meeting. "outstanding" job during the last election. (the county) in to something ( DRE's ) that wasn't really necessary". services include web hosting for the BOE at a cost of $700 a year. in the Hills of Hocking! Sherole Eaton is one of the true heroes of the 2004 election. She blew the whistle on election corruption during the recount in Ohio. As a direct consequence the County Board of Elections proceeded to fire her from her job. This is now the focus of national and international observers of the current state of the American election system. We filed in Common Pleas Court to protect Eaton from further efforts to undermine and intimidate her. We must protect such courageous witnesses from harm. The court issued an injunction against the Board in replacing Eaton, as they planned to do at today's board meeting. The implication of the suit is that Sherole will be restored to her position as the matter progresses further. Any person who successfully enforces the Ohio Open Meetings Act is entitled to legal fees and costs to be assessed against the public body that violates the law. By David B. Hickman, Jr.
Logan, OH - Progressive Ohio 2006 Backbone Campaign members drew applause at a demonstration to speak-out against the firing of an elections whistleblower. Over 30 people gathered to support Sherole Eaton at the town square gazebo across from the Hocking County Courthouse where a Board of Elections (BOE) meeting was later held. With newspaper and radio reporters present, about 25 people attended the meeting in a small room chosen by BOE officials who maintained a closed agenda that did not allow concerned citizens to discuss issues or ask questions. Several people were prevented from speaking by Gerald Robinette who repeated the phrase "you're out of order" numerous times. Each member of the BOE spent an inappropriately long amount of time discussing mundane matters. "For good cause shown Defendant Hocking County Board of Elections is hereby ordered to take no action to replace Sherole Eaton as Deputy Director of the Hocking County Board of Elections until further order of this court in this matter." One notable discussion addressed accusations that Lisa Schwartze, BOE Director, violated the law by organizing aspects of a Republican Party "Silent Auction" fundraiser from the BOE office that is supposed to be non-partisan. Schwartze publically admitted that various people delivered goods for this silent auction to the BOE office. Schwartze also publically admitted to using BOE phones to talk with people related to the silent auction. Upon hearing Schwartze's admission, concerned citizens called for investigation. Schwartze dismissed accussations as "personal attacks" but was countered by Evan Davis who stated expectations for BOE officials to uphold the law should not be defined as personal attacks. The BOE voted to table discussion of an investigation until next month and abruptly adjourned the meeting without further discussion or explanation. Let me begin by suggesting the word “contrasted” would be more appropriate than “compared.” Indeed, the difference is literally black and white. You praise the bipartisan nature of the Franklin County Board of Elections (BOE). But you fail to mention that the Director, Matt Damschroder, is the former Chair of the Franklin County Republican Party, and that J. Kenneth Blackwell, Ohio’s Secretary of State and the Co-Chair of the Bush-Cheney Re-election Committee appoints all board members as well as officers, and they serve at his pleasure. Blackwell’s actions throughout the election year were openly partisan and obviously unethical. Full Text of "Open Letter"
In a June 30th letter to United States Attorney General Albert Gonzalez, Congressman John Conyers, Jr. attacked the Attorney General's report on misallocation of voting machines in Franklin County. The Congressman also attacked Gonzalez for his failure to properly investigate all of the other allegations which have been brought to his attention.